In ceramics, the March Mug of the Month sold out in record time - I love that y'all loved it and I have had inquiries but I have to be honest I do not see me making more of these. They were more of a challenge to paint than I thought they'd be and I don't know that I want to jump into making that as a repeatable item. Having said that, never say never, right? But still, I wouldn't get your hopes up. Instead, get excited about all the other new, limited edition things I have planned! I'm also working on the ceramics for the next HaldeCrate, Cherry Bomb. Yarn bowls and soap dishes are what I decided to go with, but I have a couple of small octagon dishes I was thinking about but decided not to put in the crate -- instead I'm going to glaze them all different shades of red to see which one works best with the yarn. Because... I've dyed the yarn! And y'all. It's the BOMB! Get it? See what I did there? Speaking of yarn for HaldeCrates, there is some left from the previous crates, and a few ceramics as well. So if there's anything you worried you missed, I'm talking a little bit about that on social media this week, letting you know what's still available. And I'm doing a show this Saturday, in the Wildwood/Leesburg/Ocala area. 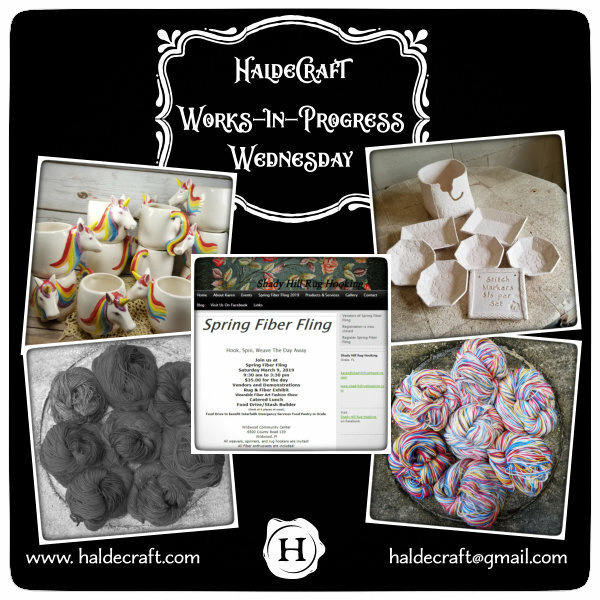 So if you're near Central/North Central Florida and like anything having to do with weaving, spinning, rug hooking, demos, hanging out with other fiber enthusiasts.... think about stopping by on Saturday! That's about it for me this week. How about y'all? What are you up to? What's filling your days this week?